DBD fluorescent dyes have proven to be useful in\r\nnumerous applications. To widen the range of biological applications,\r\nwe propose three different types of DBD molecules\r\nthat have been modified in such a way that DNA interaction\r\nbecomes probable. After the successful synthesis of\r\nall three compounds, we tested their fluorescent properties\r\nand their DNA binding abilities. 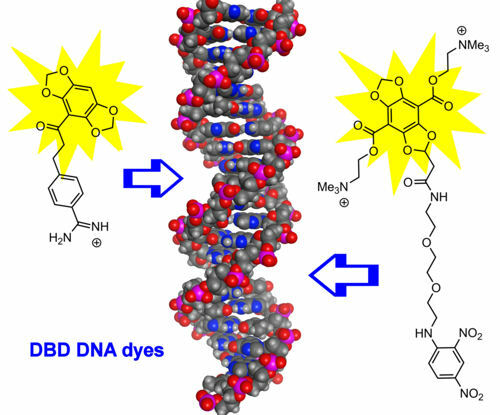 Two of the three probes exhibit\r\nan interaction with dsDNA with subsequent fluorescence\r\nenhancement. The determined binding constants of\r\nthe two new DNA dyes are comparable to other minorgroove-\r\nbinding dyes. Their large Stokes shifts and their long\r\nfluorescent lifetimes are outstanding features of these dyes.